Pickup from airport at 13:50 pm & transfer to hotel. Afternoon reach Hyderabad and depart for sightseeing of Hyderabad Birla temple , Jaggannath Temple, Shyam Mandir, Visiting Char Minar. Night in Hyderabad. Morning after breakfast leave for Ramoji Film city full day excursion at Film City. Evening at your leisure & overnight stay at hotel. Morning after breakfast leave for Darshan at Temple of Mallika Arjun Jyotirlinga. Later leave for Hyderabad by road surface approx 220kms/ 5 hrs. 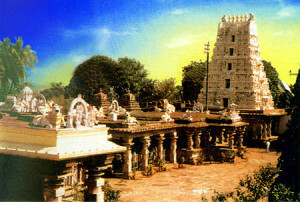 Afternoon reach Hyderabad and depart for sightseeing Jubilee Hills Peddama temple. Chowmahhalah Palace. Overnight at Hotel. Full day depart for sightseeing of Hyderabad World Famous Museum The Salar Jung Museum. Morning after breakfast check out from hotel, Lord Venkateshwara Temple, Birla Mandir, Nehru Zoological Park, Qutub Shahi Tomb. evening transfer to Airport.